A fun twist to any room, chalkboard paint–covered walls and surfaces invite playful experimentation and interaction by kids and adults alike. Take a nod from these five modern homes. 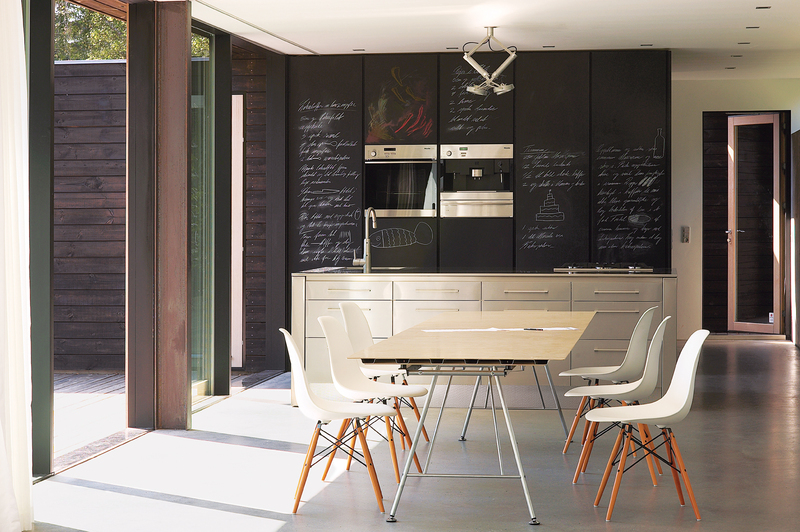 Chalkboard-fronted cabinets provide an ideal surface for scrawling shopping lists at this summer retreat. Margaret Oomen was well into the process of reappropriating a portion of her dining room for use as a creative studio, but six months of searching for the perfect vintage pegboard turned up no solid leads. Oomen, a family doctor and crafty blogger based north of Toronto, had conceded to purchase a new one when ingenuity struck in the aisles of Home Depot. Two quick and cheap coats of chalkboard paint transformed the standard panel into a customized storage system that doubles as a display. In this Bratislava apartment, the architects Gut Gut designed a modular shelving system out of plywood that gets repeated throughout the house. Here, the kitchen island with induction cooktop and the bookshelves are clearly from the same family without looking like twins. A green Dish Doctor by Marc Newson for Magis adds a splash of color next to the sink, and a chalkboard wall welcomes the kids' drawings. At this garage-turned-playroom in San Francisco, writing on the walls is encouraged by a magnetic slate chalkboard from Claridge Products. A Phoenix table by Patricia Urquiola for Moroso serves as a play table. In December 2007, Nicolette de Waart, her husband, Joost Dop, and their four children moved from Heemstede, the Netherlands, to Singapore. De Waart founded an interior design business and made over their own home first—including adding a chalkboard to the kitchen for writing memos and for drawing, as Tammo does here.